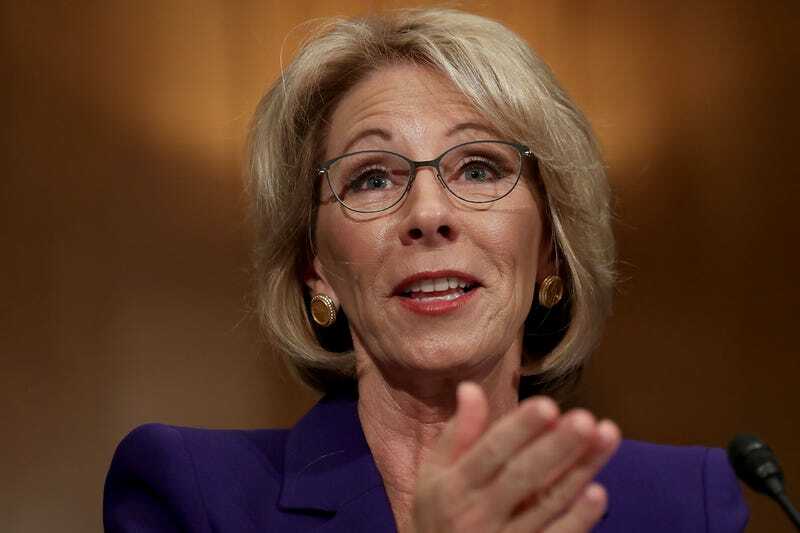 As the ongoing saga of President Donald Trump’s Cabinet confirmations continues, two GOP senators have come forward and said they will vote against Betsy DeVos for education secretary, giving Senate Democrats two of the at least three votes they will need to block her appointment. Sens. Susan Collins (R-Maine) and Lisa Murkowski (R-Alaska) made their decisions public Wednesday, but despite their dissent, the Washington Post reports that Republican leaders are confident DeVos will still be confirmed. “She’ll be confirmed—you can take that to the bank,” Sen. John Cornyn (R-Texas), the majority whip, said. Collins and Murkowski both noted that they appreciate DeVos’ efforts to help at-risk children by advocating for vouchers and charter schools, but they are concerned that she lacks the experience needed to serve as education secretary and improve public schools. DeVos did not attend public school herself and has never worked in a public school environment. Murkowski’s decision was based on both an outpouring of responses from Alaskans as well as her own research. She said she isn’t persuaded that DeVos can help strengthen the public school system that children in remote communities across Alaska depend on. “I was trying to get to yes. I just couldn’t,” Murkowski said. Republican leadership aides say that a final confirmation vote should happen either over the weekend or early next week. There are 48 senators in the Democratic caucus. If they vote as a bloc against DeVos, and if they are joined by Murkowski and Collins, the vote to confirm would be 50-50. In that event, Vice President Pence—a staunch DeVos supporter—would cast the tiebreaking vote. It would mark the first tiebreaking vote by a vice president since Richard Cheney did so nine years ago. Joe Biden, Cheney’s successor, went eight years as vice president without ever breaking a tie. As the Post notes, if a third Republican senator votes against DeVos, she could lose the confirmation vote. Meanwhile, White House press secretary Sean Spicer said that Trump’s administration is not concerned that DeVos’ nomination will be voted down.